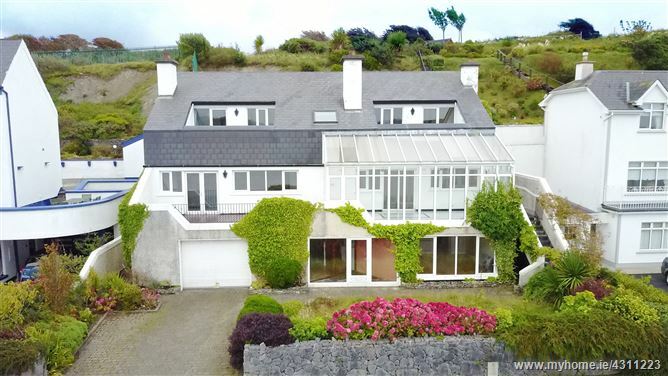 A great opportunity to acquire an impressive detached residence situated in a wonderful location with unrivalled panoramic views over Rusheen Bay. Extending to approximately 3,875sqft² of bright living space, over three floors, with the main living space at first floor level ensuring that the sensational views are fully taken advantage of. Although the property requires some modernisation, it has many features and includes hollowcore flooring, an integrated hoover system, a basement garage with roller doors and an enclosed patio overlooking the Bay. Situated at the end of a quiet cul-de-sac, right on the seashore, with no through traffic. An outstanding home in a most stunning location. Second Floor:Four bedrooms; Two ensuite bathrooms; Main bathroom. Slate floor tiles; pvc double glazed windows and doors. Hollow core flooring; feature wood panelling; radiator covers. Fully tiled; double stand alone shower; WC; WHB. Wood floors; built in wall to ceiling closets. Tiled floors; door to garage. Wired for electricity; roller doors.